Innisfree Camellia Essential Hair Mist - Tried it Yet? 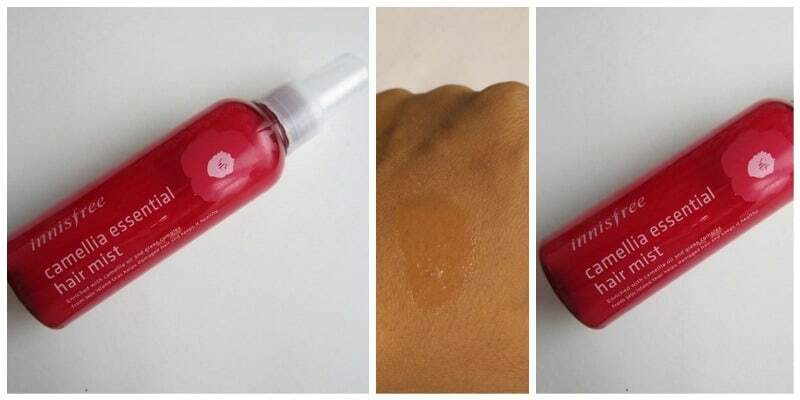 Home ReviewsBeauty Innisfree Camellia Essential Hair Mist – Tried it Yet? Innisfree Camellia Essential Hair Mist – Tried it Yet? Who is this for? Innisfree Camellia Essential Hair Mist is basically designed to provide adequate nutrition to the hair and preventing them from hair damage, split ends. It also adds shine and gloss to the hair. It contains Jeju camellia oil which contains an abundance of fatty acids, essential to provide nutrition to hair and also adds non- greasy shine to our hair. Rs. 700 for 150 ml. This serum comes in a cute little plastic bottle which is bright red in color. It has transparent plastic pump and dispenser. It has got a plastic transparent lid or cap which closes very tightly and does not open up without pressure thus making this packaging leak proof. Pump ensures that no wastage of serum must be there. It contains thick transparent or very slightly milky gel which is very lightweight. It is not too thick nor too runny. It smells heavenly. It is very soothing but stays for very less time. I wish it could have stayed for longer. I have been using this serum for a month and its results are quite good. It simply turned out to be a boon for my hairs. It just adds shine and gloss to my hair. Most importantly what it does is, provide adequate hydration to my hair thus preventing hair breakage and issues of split ends. It has resolved my issues of split ends completely. A bit pricey.But I can say it is worth every penny. Yes, I will definitely recommend this to everyone. I know its bit pricey but still, it’s worth buying. It has got all that you need from a serum. It is simply a boon! Believe me, Its great! Must try it, Thumbs up! Glossypolish verdict – It’s a great serum, has got all qualities and is it true to what it claims. Thumbs up! Delon + Smooth Vanilla Body Butter -Must Have? Khadi Natural Kiwi Fruit Lip Balm – Natural Beauty? This seems like a nice product! Even the packaging is very striking. I guess it works wonder in dry hair.